(Nanowerk News) IBM awarded an international prize to the Johannes Gutenberg University (JGU) Mainz, Germany - to support research work being carried out by Professor Dr Claudia Felser to improve solar cells. 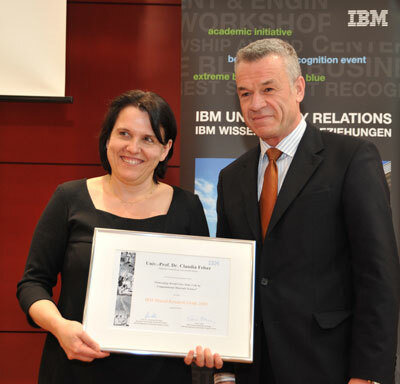 During a ceremony at Mainz University, Professor Felser of the Institute of Inorganic Chemistry and Analytical Chemistry received the IBM Shared University Research Award. IBM's award entails the provision of state-of-the-art computer systems to the JGU to the value of approximately $450,000. The computers will be used for computer modeling of new materials for solar cells, in order to increase the efficiency of the photovoltaics and simultaneously reduce the use of harmful substances. At the ceremony last Friday the German Federal Minister of Economics and Technology, Rainer Brüderle, and Doris Ahnen, Minister of Science of Rhineland-Palatinate, emphasized the great importance of university research and its links with outside partners in the process of developing forward-thinking technologies. The Federal Minister of Economics and Technology, Rainer Brüderle, said: "Mainz is sending out a clear message: Germany's researchers are at the forefront of innovation. Our universities are in a prime position on the world stage. Professor Felser on her part is truly developing a technology of the future in that thanks to her work, it is possible to increase the efficiency of solar cells." Professor Claudia Felser (l.) and Erwin Jung, director of IBM Science Relations. According to the Minister of Science of Rhineland-Palatinate, Doris Ahnen, the federal state government sees the foundations of the future in science, research, technology, and the transfer of knowledge: "Research and development in universities and external research institutions lay the foundations for competitiveness, social security, and the prosperity of a modern political economy. The research and innovation policies of the state of Rhineland-Palatinate are therefore building a bridge linking the advancement of basic research to applied research and research implementation in the process of innovation. At its very best this can also be seen in individuals - such as Professor Felser!" IBM awards the Shared University Research Award two to three times a year in order to support joint work with research institutions across the world. The award to Mainz University is founded on an almost 15-year long working relationship between IBM and Professor Felser, one of the great experts in the field of computer-supported materials design. In her research group at the Institute of Inorganic Chemistry and Analytical Chemistry researchers have been working for two years on computer modeling of thin-film solar cells, in order to improve their efficiency and to reduce the proportion of environmentally harmful and rare earth elements such as cadmium and indium. Professor Dr Johannes Windeln, materials scientist at IBM, who is leading the project with Mainz University, stressed the importance of Felser's work: "This technology will support the move away from conventional to renewable energies and will thus help us meet future demands made on the energy sector. This award to Mainz University brings a new world record in the field of thin-film solar cells within striking distance." Professor Windeln has already led important research projects in the field of semiconductor technology in the IBM research laboratory in Rüschlikon. "Whilst universities are in the first instance a place for basic research, we also have a social responsibility to make our knowledge available to society wherever possible," said Professor Dr Georg Krausch, President of the Johannes Gutenberg University Mainz. "Professor Felser - one of our most outstanding researchers - has succeeded in bridging the gap between basic research and the application of research findings in an exemplary way. I am therefore delighted by this distinction, which benefits both Professor Felser and the whole university." The research, led by Dr Thomas Gruhn, focuses on CIGS solar cells, which are only a few micrometers thick and which to date show an efficiency of almost 20%. They are cost-efficient to produce, requiring minimal energy and materials. Because they are so thin and correspondingly light and flexible, they can be applied on items of clothing or tarpaulin. However, the disadvantage lies in the fact that until now, no appropriate material has been discovered to replace the use of the environmentally harmful heavy metal cadmium in this kind of solar cell. The Mainz group hopes to find a replacement material made from so-called half-Heusler compounds. Half-Heusler compounds and the structurally similar Heusler materials are intermetallic compounds made from three elements that form a cubic crystal structure. Felser is one of the world's leading specialists in this field. The new computer facilities will make it possible to expand the search for optimal materials to other potential materials, and to predict their behaviour with the help of computer modeling, even before being tested in the laboratory. A further aim is to increase the efficiency of thin-film solar cells. In this endeavour, CIGS solar cells present scientists with a riddle that has remained unsolved for many years now: the "indium/gallium puzzle." The ratio of the two elements to one another is critical to the efficiency of solar cells. In practice, solar cells with a higher proportion of indium show a higher efficiency than solar cells with a higher proportion of gallium - quite in contrast to scientists' predictions. The reason for this may soon be demonstrated by new computer simulations. It might then be possible to further improve the already high efficiency levels of CIGS solar cells. In a research project of the Federal Environment Ministry, IBM and Mainz University are working on the improvement of thin-film solar cells. Schott AG in Mainz, the Helmholtz Center for Materials and Energy in Berlin (HZB), and the University of Jena are also members of this research. Photovoltaics is expected to be a key technology that will contribute to the goal of raising the proportion of total power consumption provided by renewable energies to at least 20% over the next 10 years. "We hope that our work will enable us to make a significant contribution to this aim," said Felser at the presentation of the IBM research award. Claudia Felser has been a professor at the Johannes Gutenberg University Mainz, Germany, since 2003 and works at the Institute of Inorganic Chemistry and Analytical Chemistry on new materials for computer technology as well as on high-temperature superconductors. She is the spokesperson of the "New Materials with High Spin Polarization" research unit of the German Research Foundation and director of the "Materials Science in Mainz" Graduate School, which has been successful in the Federal Excellence Initiative. In 2001, Felser received the State Order of Merit of Rhineland-Palatinate for establishing a laboratory for pupils at Mainz University. In autumn 2009, she received one of the most internationally acclaimed awards in the field of magnetic for her work on raw materials in spintronics, i.e., the title of "Distinguished Lecturer" from the American IEEE Magnetics Society. Felser is currently working on specific research projects at Stanford University in California.